More than a third of teachers have been subject to online abuse, according to a survey conducted by Plymouth University. The majority of the abuse - 72% - came via pupils but over a quarter was initiated by parents. The majority of teachers claiming online abuse were women. Much of the abuse is via chat on social networks but the study also found that many were setting up Facebook groups specifically to abuse teachers. In some cases, people posted videos of teachers in action on YouTube while others put abusive comments on ratemyteacher.com. In total, 35% of teachers questioned said they had been the victim of some form of online abuse. Of these, 60% were women. Perhaps surprisingly, 26% of the abuse came from parents. "This parental abuse is something we haven't come across before," said Prof Andy Phippen, the author of the report. "Sometimes they are abusing other children at the school as well. Schools need to clamp down on it, or it will increase in prevalence," he warned. The cases of children suffering online bullying have been well-documented but the issue of teachers being abused is less well-known. But it is a growing problem. The National Association of Head Teachers (NAHT) said that it receives calls every week from teachers who believe they have been cyberbullied. The study took testimony from more than 300 professionals in an anonymous internet-based survey and followed up with a handful of in-depth interviews. Many of these revealed the human cost such cyberbullying was having. One teacher said: "I eventually had a breakdown in the summer holiday needing an emergency doctor to be called out - as I had become suicidal. "I had intensive support from the mental health unit via my GP, a new telephone guidance service that really helped me plus medication which was a great help, and still is." The guidance service referred to is the Professional Online Safety Helpline, a new initiative from the Safer Internet Centre. 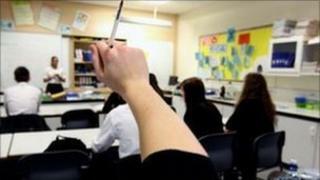 In another testimony, a teacher was falsely accused of "inappropriate behaviour" towards a pupil. "I was questioned by the police on one single occasion and released without charge, caution or reprimand... I also ended up in the care of a psychologist to help me deal with the loss of self-worth, depression and the urge to commit suicide," the teacher said. For Prof Phippen the phenomenon illustrates a shift in how parents and children address issues at school. "It seems to a subset of the population the teacher is no longer viewed as someone who should be supported in developing their child's education, but a person whom it is acceptable to abuse if they dislike what is happening in the classroom," said Prof Phippen. "Clearly some people are viewing social media as a bypass to the traditional routes (head teacher, board of governors) of discussing dissatisfaction with the school," he added. Facebook offers tips for teachers and promises to respond to reports of individual harassment within 24 hours. "These online discussions are a reflection of those happening offline," said a Facebook spokesman. "But while you can't report a conversation outside the school gates or easily stop a person sending abusive, anonymous emails, Facebook have worked hard to develop reporting mechanisms that enable people to report offensive content they are concerned about."